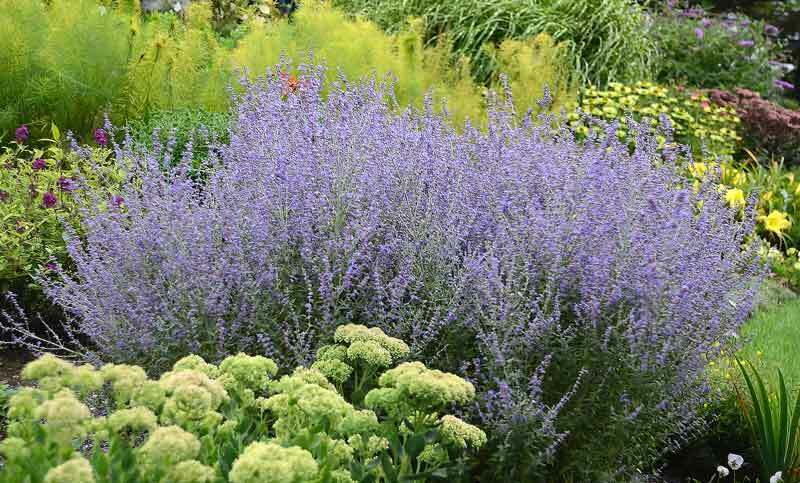 Gardeners have long loved Russian sage (Perovskia atriplicifolia) for its airy texture and love of hot, sunny sites. While most cultivars tend to be too large to fit in most gardens and the stems flop over, that has changed with newer cultivars. ‘Denim & Lace’, ‘Little Lace’ and ‘Rocketman’ don’t grow too tall and stay 28 to 32 inches and have stronger stems and a more upright habit than older varieties. The bushy clumps have spikes of rich lavender-blue flowers that appear from mid summer to late fall and these are attractive to butterflies.